Artifacts left by early 19th century Irish immigrants can often be few and far between. One rare example is this piece of pottery at the Smithsonian Institution in Washington, DC. 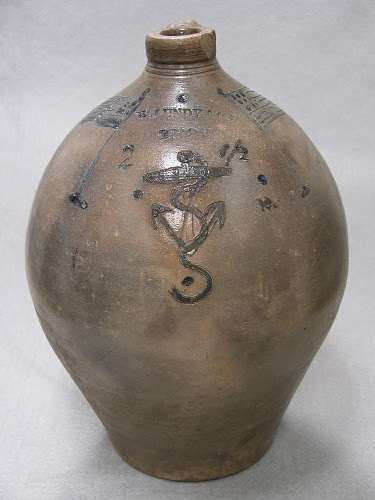 It was made by William Lundy and “the unusual decoration on this jug features two American flags and an anchor.” Lundy worked as a potter in Troy, NY and was most active in the 1820s. 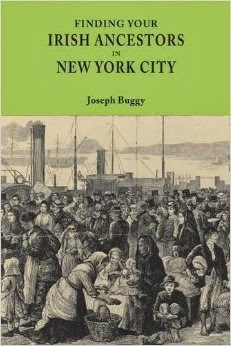 Many Irish immigrants came to this part of New York State in the first half of the 19th century, attracted by the developing industries in Troy and nearby Albany. You can view the artifact in more detail on the Smithsonian website. If anyone is a descendant of William Lundy, or knows where he came from in Ireland, it would be great to hear more about his life in the comments section. I am a descendant of William Lundy through his son Charles H. Lundy, whose daughter Celia Lundy married my great-great grandfather, William James Copeland. In a story written about Lundy's son John S. Lundy, it says that William Lundy was from County Monaghan in Ireland. I have not been able to confirm that, however. And William Lundy's brother Robert Lundy, who also lived in Argyle, listed his place of origin as a different location in his naturalization papers. I would like to find out if anyone has naturalization papers for William Lundy, and I would like to know who William Lundy's first wife Ruth Leonard's parents were.